DownloadStudio lets you download movies, TV shows, videos, music and photos onto your computer or NAS drives. Mezzmo lets you stream movies, TV shows, videos, music and photos from your computer or NAS drives to your DLNA/UPnP devices in your home. You must have both DownloadStudio and Mezzmo installed on your computer. If you have not already purchased these tools, then you can download the fully-featured 15-day trial versions from www.conceiva.com/downloads for your evaluation. 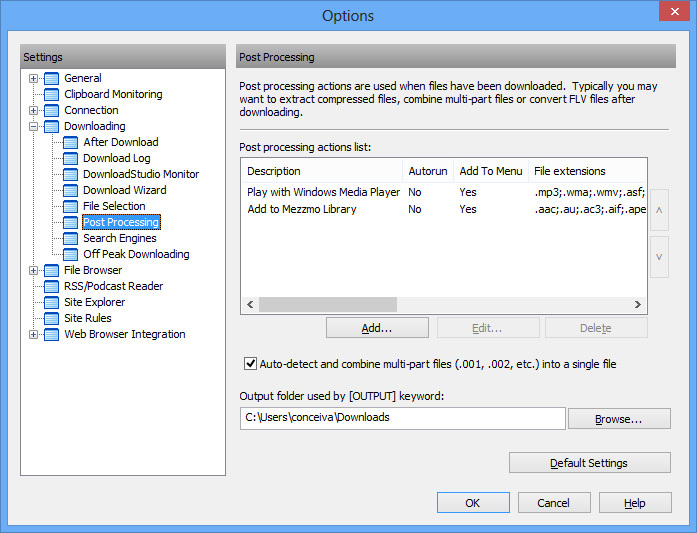 Run DownloadStudio and go to the Options dialog (Post Processing page). 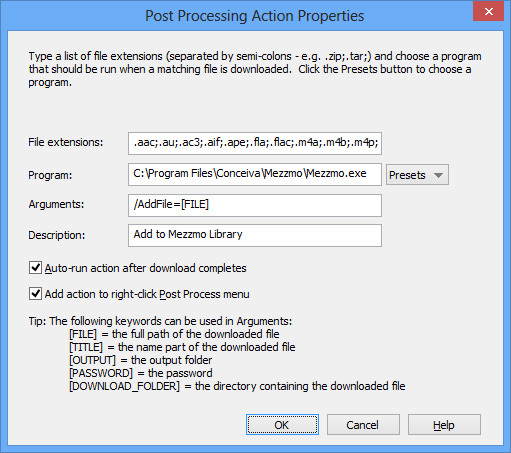 Select the Add to Mezzmo Library post processing action and click Edit... to display the Post processing Action Properties dialog. Select the Auto-run action after download completes checkbox. This tells DownloadStudio to add the downloaded file to Mezzmo after a file has been downloaded. Important: Make sure the list of file extensions matches the types of files that you want to add into your Mezzmo library. By default, the popular video, music and image file extensions are listed. You can reduce this list to the file extensions that you wish to add to your Mezzmo library - for example, just video files. Now, when you download a file using DownloadStudio, the file will automatically be added into your Mezzmo library and will be ready to be streamed to your devices!